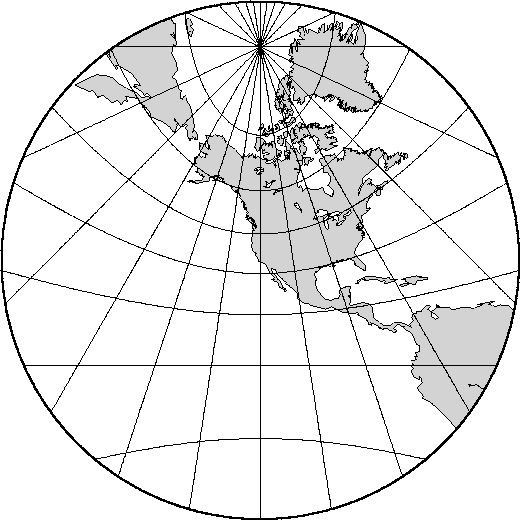 The Gnomonic azimuthal projection is a perspective projection from the center onto a plane tangent to the surface. Its origin goes back to the old Greeks who used it for star maps almost 2500 years ago. The projection is neither equal-area nor conformal, and much distortion is introducted near the edge of the hemisphere; in fact, less than a hemisphere may be shown around a given center. The directions from the center of projection are true. Great circles project onto straight lines. Because it is mainly used for pictoral views at a small scale, only the spherical form is necessary. Longitude and latitude of the projection center. The horizon, i.e., the number of degrees from the center to the edge. This must be 90 . Scale as 1:xxxxx or as radius/latitude where radius is distance on map in inches from projection center to a particular [possibly oblique] latitude (-Jf), or map width (-JF). Figure 6.12: Gnomonic azimuthal projection.